As you might have guessed, I”m a big fan of large, public displays of art. It can be a small piece of graffiti on the wall that makes me chuckle, or it can be street theatre involving a 40ft tall mechanical spider. I try not to ask for much. So this weekend in Liverpool has brought three of them all along at once, and I”ve loved it all. Super Lamb Bananas. Lots of people have heard the name by now. It was originally a huge 17ft tall sculpture by a Japanese artist named Taro Chiezo. 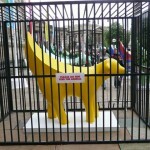 As with a lot of great pieces of art it was originally met with a resounding “huh?” by the local population of Liverpool. However, when art lovers and travellers from all over the UK to visit, they all went “huh?” too. 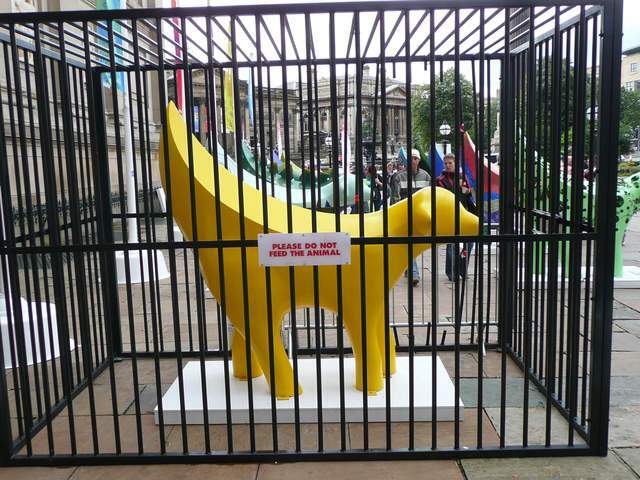 So it”s no great surprise that the 2008 City of Culture created 125 two-metre high versions and put them all over the city. Everyone is still going “huh?”, but the persistence is making everyone grow to love these little genetically modified beings. Liverpool has painted its spirit onto every single one of the unique animals, and it now sits firmly alongside the Liver bird as a modern-day symbol of the city. And now, the 8th-9th September sees a huge amount of them on display at the front of St. George”s Hall, before they”re auctioned off for charity on Wednesday. The original experience was like the pigs I”ve talked about in Bath, but Liverpool did really beat them to it. And they used genetically modified animals (originally to highlight the dangers of GM crops). You can almost sing along to “Cities just wanna have fun” (to the tune of Girls Just Wanna Have Fun) as you parade madly through the distorted flock. And you probably wouldn”t get any funny looks. Another Place is much more serene, slightly disturbing and intense. I had no idea it was near Liverpool, but a helpful lady on the train on the way in had mentioned it as a place that would be great to go and see if I could find a bus. 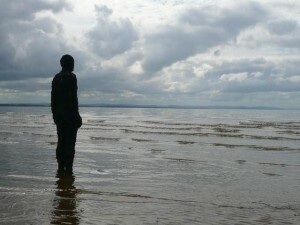 It”s 20 minutes from Liverpool Central on the Northern Line to Crosby, or Waterloo. Both an easy 10-minute walk from the beach that stretches for 2 miles, and is full of 100 statues of Anthony Gormley, staring out to sea. I”m a big fan of Anthony Gormley, and this piece is reminiscent of Event Horizon where 31 statues were placed on rooftops around London. Designed to symbolise the relationship that man has with nature, Crosby beach is such a perfect location, with signs of industry to one side, wind farms in the distance, and a long sandy (often muddy) beach meeting the sea at the horizon. So perfect, that when it came to November 2006 when the exhibit was to be moved to New York, it stayed in what will hopefully a permanent home to these 100 figures. During particularly high tides all 100 figures are totally submerged, swallowed by the sea to return the next day, slightly greener, a little more worn, but still standing. A lot could be said for this as a metaphor… But having already fallen in love with a spider, genetically modified lambs, and a city running high on enthusiasm and a will to enjoy itself… I think I”ll leave this one up to you….